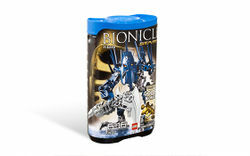 7137 Piraka is one of the BIONICLE Stars sets released in late 2009 and early 2010. 7137 Piraka contains 15 pieces to build the Skakdi warrior known as Nektann. He wields a curved, silver scythe. The last part of the set is a part of the golden armour, the right arm armour. Warlord Nektann of the Skakdi race has allied with Makuta, and now leads his people in a fierce attack on this new world. The Skakdi armies, originally from the island of Zakaz, traveled to one of the Matoran universe’s southern islands, where they battled a small army of Rahkshi. While the Rahkshi held the upper hand at first, the Skakdi managed to decimate their opponents’ ranks. Nektann later decided to serve Makuta, and brought his small army to Bara Magna’s surface where they fought alongside Rahkshi and rogue Skrall. This is a description taken from LEGO.com. Please do not modify it. (see an archive of the product's page) Rogue warlord of the Skakdi! Once a powerful Skakdi leader, Nektann has gone rogue and become a Piraka. Allied with the evil Makuta, he challenges the might of the Glatorian in a final battle for the fate of Bara Magna. Includes one of six golden armor pieces. Piraka, a BIONICLE villain, is armored with double edged blades and spikes on his shoulders! This character is actually called Nektann, but Greg Farshtey chose the name after the canister was already finished. Ironically, in the storyline it is said that Nektann is taller than other Skakdi. Some BIONICLE fans believed this set was Vezok, because of the colour scheme and the appearance. Plus, the prototype model carried Vezok's Water Harpoon. He has the least parts of all the BIONICLE Stars. Nektann is the only Star character that was not released before 2010. The set was originally going to be named Skakdi, but since the term Piraka is known much more it was used. Rogue warlord of the Skakdi!